BRONX, NY- According to Bronx.news12.com, a crash on the Cross Bronx Expressway caused two individuals to be hospitalized. The collision involved a large dump truck that left the roadway and struck several trees. According to witnesses at the scene, rescue workers had to use tools to pry open the injured driver’s door and remove the man from the vehicle. The crash involved a second vehicle, a white SUV that is owned by a laundromat on Long Island. The driver of the SUV was also injured and transported to the hospital via ambulance. Some reports indicate that the driver of the truck may have suffered a medical emergency that caused him to lose control of his vehicle. Medical emergencies only cause a small fraction of overall roadway crashes. 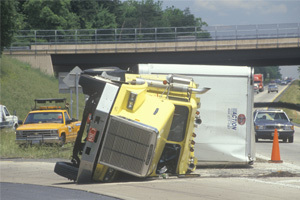 When these accidents do happen, they are mostly because of seizures, diabetic blackouts, and heart attacks. It is difficult to prevent these accidents because, for many people, the medical episode is completely unpredictable. One possible way to help prevent these crashes is by teaching patients about the early symptoms of some of these medical conditions. This could help people know when they need to pull over before they are unable to control their vehicle. Of course, most crashes are not the result of unavoidable medical conditions. In around 90 percent or more of all crashes, the cause is human behavior. Distracted driving, drunk driving, or aggressive driving are all far more likely to cause a crash than a heart attack or stroke. If drivers believe that they might be susceptible to a condition that could impact their ability to drive, they should speak with their doctor about whether it is safe for them to operate a vehicle.